Color : Black Multicolored wind chime set with display case and stand for chimes comes in sets of 4 six different chimes to choose from. Product display as shown in the image. 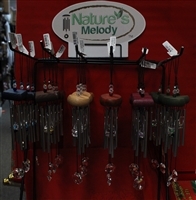 These windchime are high quality, premium sound.